Home Page › Uncategorized › Taking it Outdoors, Take your show on the road! Taking it Outdoors, Take your show on the road! Comments Off on Taking it Outdoors, Take your show on the road! Looks great indoors displays, but made to go outdoors! Outdoor retractable banners are effective, functional and easy to carry – displaying your product with high impact graphics! Retractable banners can accompany larger displays highlighting a product specific to the event. Instant sign Factory’s outdoor, two sided retractable banners stand up to the elements! Interchange your message! Once you have the hardware you just need to replace the graphics for future events. 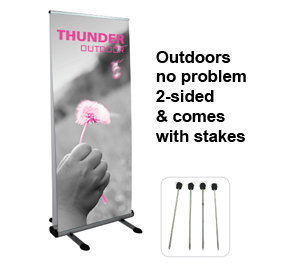 Outdoor two sided, retractable banner stands feature large twist-lock feet to keep stable, and includes stakes for use in securing to the ground. For more information about the “OUTdoor“.